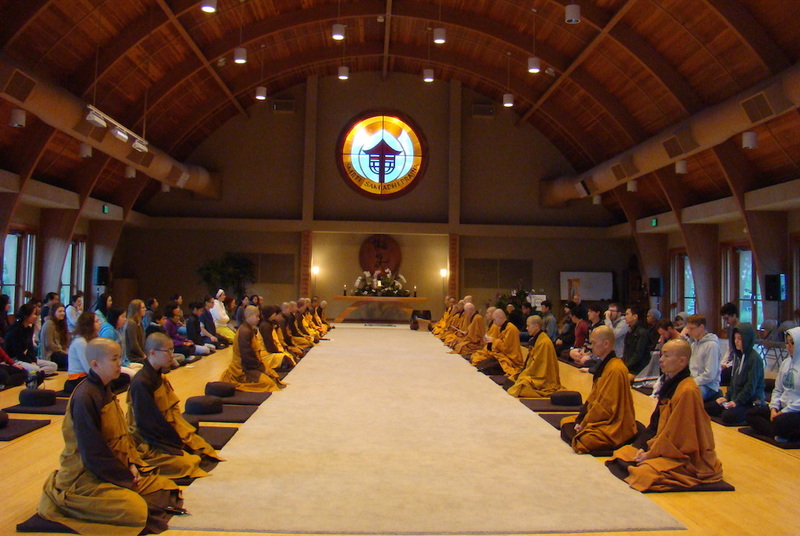 Deer Park Monastery is a mindfulness practice center and monastic training center founded by the Vietnamese Buddhist monk, author, and peace activist, Thich Nhat Hanh (Thay). Deer Park is a place to quiet the mind, look deeply, and enjoy the wonders of life within and around us through the practices of sitting meditation, walking meditation, mindful eating, deep relaxation meditation, and sharing togetherness. We invite all who wish to cultivate peace and happiness in their lives to plan a visit — for a day or for a retreat. This 400-acre sanctuary rests peacefully in the chaparral mountains of southern California, surrounded and protected by oaks and the natural landscape. It was established in July 2000 by the Plum Village four-fold Sangha. Now, it is a safe and serene refuge for many practitioners to come and learn the art of mindful living and to practice with a community, a Sangha. At Deer Park, the residential monastic community and lay community practice together year round under the guidance of our teacher, Thich Nhat Hanh (Thây), in the tradition of engaged Buddhism, practicing mindfulness throughout our everyday life. There are two hamlets: Solidity Hamlet (for monks and laymen) and Clarity Hamlet (for nuns and laywomen). The two hamlets come together several times a week to practice. At Deer Park, we are nourished not just by the formal sitting meditation sessions, but also by the practice of meditation in our daily activities outside the meditation hall. We are guided by the teachings of Thây on mindfulness and peace-making. We learn to live together as a community and to take refuge in the wisdom of the Sangha. Deer Park is part of a larger family of monasteries, including our root monastery, Plum Village, France, where our teacher, Thay, resides. All of the monastic members of our community are direct disciples of Thay Nhat Hanh, and are trained under his close direction.